You know how much time and effort goes into maintaining your pool, but have you given real thought to pool covers? How do you know if you’re using the right one? Or if you’re looking at winter pool covers for the first time, how do you know what to buy? When it comes to protecting your much-loved investment, you’re best bet is to go with pool safety covers. Pool safety covers can be trusted to protect your swimming pool from dirt and debris, but more importantly, they protect children, animals, and anything at all from getting trapped beneath the surface. There are a few options to choose from, so consider what works best for your needs. … then look into mesh winter pool covers. These lightweight superstars are one of the most affordable choices, yet durable enough to withstand thousands of pounds and last 15 years or more with proper care. Since they’re light, they also tend to be the most manageable option for pool owners, however, they can vary when it comes to sunlight. To prevent algae growth, look for one that blocks out most of the light rather than just the UV rays. Consider a Loop-Loc pool cover, which can block out as much as 99 percent of sunlight. 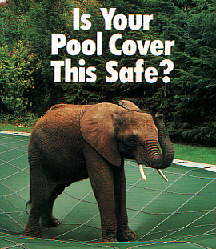 … then look at solid pool safety covers. These impermeable pool covers protect your pool from debris, snow, rain and sun, making for a sparkling-clean opening next season. However, they do require some maintenance since the water collected on top must be pumped regularly. These may cost a little more mainly because they come with that pump. … look for a hybrid safety cover. Rather than having to pump the water out like a solid cover, hybrid winter pool covers use mesh panels to drain water into the pool. Like mesh covers, they’re pretty light, making removal, cleaning, and storage a synch. While there are many pool safety covers to choose from, a lot of pool owners tend to want a Loop Loc pool cover. Designed for any size pool and made in a variety of colors and styles, their pool covers provide ultimate in protection that works for your lifestyle. Your local pool company can lock in one of these reliable covers for you this season!